Do you talk green in a country facing economic collapse, skyrocketing unemployment and widespread anxiety, endless political instability and the rise of meaningless populism? Yes, you do. You talk about healthy and sustainable economies within the limits of the planet, good jobs, a happy life close to nature, inclusive and transparent democracy. Do you talk green in a country facing economic collapse, skyrocketing unemployment and widespread anxiety, endless political instability and the rise of meaningless populism? Yes, you do. You talk about healthy and sustainable economies within the limits of the planet, good jobs, a happy life close to nature, inclusive and transparent democracy. Ultimately, you reclaim populism in its literal sense: you advocate for the true good of the people and the common home of all. In its original meaning of the Greek word κρίσις, a crisis is not just about a dramatic state of affairs, but also about judgment and choice. Gloom and decision are the two faces of the same coin. The current crisis is indeed leaving a heavy footprint on both nature and society. But it should also be viewed as a call for decisive action. Greece is rich: One of the ecologically richest countries in the European Union, over 1/3 of Greece’s area in 419 sites is protected for its ecological significance , while another 4,450 sites are protected as archaeological and cultural monuments. The two Greek archipelagos are comprised of over 2,800 islands, only 227 of which are inhabited and host 670 small and ecologically valuable wetlands. In terms of human capital, Greece is one of the globally richest countries in well qualified and educated professionals. The country is also very rich in renewable energy sources, primarily wind and sun. Greece is poor: With a soaring public debt of EUR 219.8bn or 177% of GDP, unemployment skyrocketing at over 24% for the third consecutive year while only 49% of people aged 15 to 64 having a paid job (the lowest in the OECD) are the most widely known features of Greece’s poor economic outlook. Adding to these, Greece is a notorious laggard in forward-looking and innovation-inducing policies, particularly in the field of energy: over 75% of the country’s total primary energy production depends on poor quality and highly polluting lignite and oil. Greece is in trouble: The prospects of sustainable economic activity and social development in Greece are seriously undermined not only by the debt crisis, but also by a series of structural problems such as poor quality of law making, absence of key land planning tools, and serious deficits in transparency and participatory decision making. Also, as shown by WWF’s MedTrends , the Mediterranean needs to urgently respond to a series of mounting pressures on its ecological capacity, such as poor coastal and marine habitat protection, a surge in new oil and gas exploration contracts, increased marine traffic, and massive tourism developments. 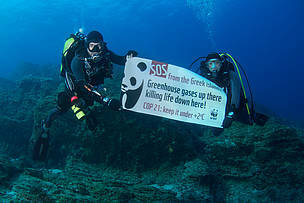 At the heart of WWF Greece’s work on economy lies the indisputable conviction that the good of the people is and will always be dependent on the good of the Earth’s ecosystems and resources. 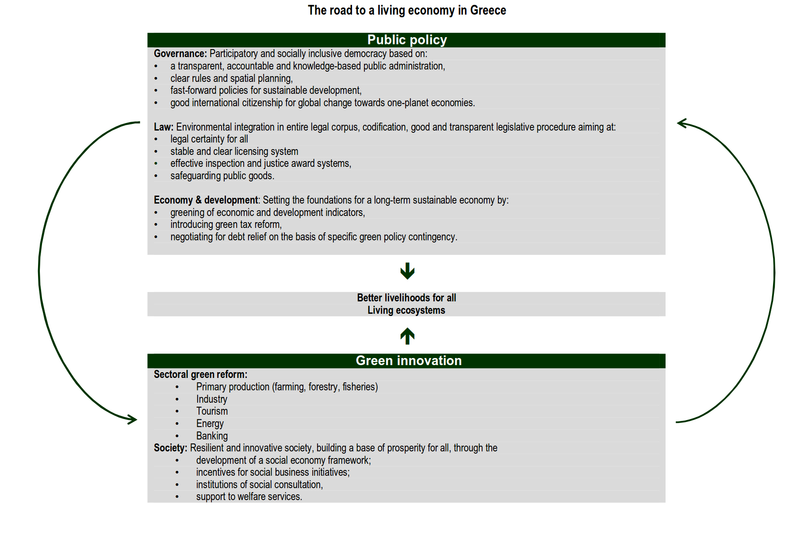 Following a thorough analysis of the problems undermining Greece’s prospects for a living economy, WWF Greece formulated a vision for a truly sustainable economy: the roadmap by the title “A living economy for Greece” was announced in 2013, following review and endorsement by the Athens office of the Boston Consulting Group. This is also a vision for Greece’s battered economy, as it thoroughly examines the Greek reality: a fragile economy that still has tremendous potential for good governance, innovation and competitiveness. 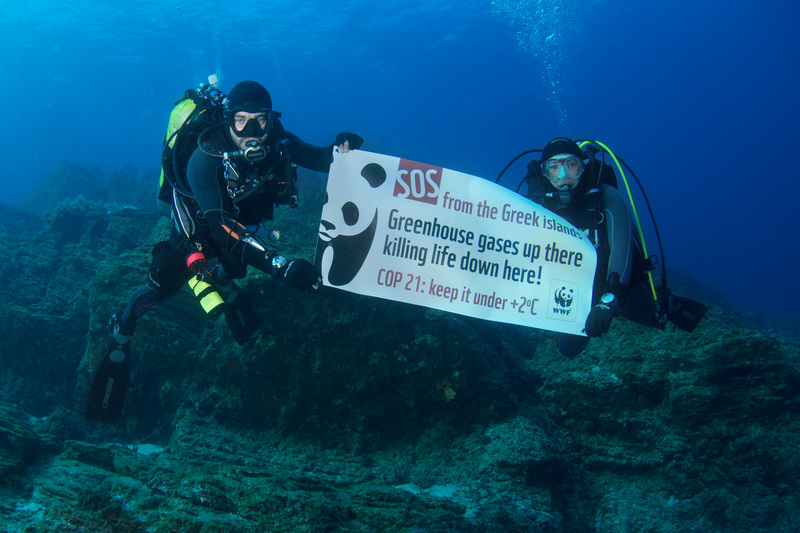 Drawing on from this roadmap, WWF Greece is developing a series of dynamic and innovative interventions, focusing on the fields of energy and fisheries. Building a fossil-free future for Greece: After proving beyond doubt that the planned new coal plants of the Public Power Corporation are neither economically viable nor the best choice for adequate energy production , WWF Greece now focuses on opening the dialogue for the post-lignite future of the coal-dependent region of Western Macedonia. The plan systematically elucidated the potential for job creation and generation of local GDP in this region which is plagued with one of the highest levels of unemployment in the EU. The development potential of a series of economic activities was thoroughly analysed, along with the potential funding sources for the implementation of the plan for a living local economy. In parallel, we also developed a proposal for a renewables-based district heating system for the city of Ptolemaida, in order to fully address a basic fear of the local society that their heating needs will not be covered efficiently and economically if coal is phased-out. Through these studies, scientifically corroborated publicity about the detrimental impact of coal on environment and human health, and consistent dialogue with the key local stakeholders, we have managed to reverse the previously overwhelmingly pro-coal attitude in this poor region: according to a recently announced opinion poll , half of the people living in Western Macedonia now support the cancellation of all plans for new coal. Further south, on a small island in the Aegean, innovation brings energy autonomy to life: TILOS Horizon is developing a renewable energy smart grid system which will cover the energy needs of the island of Tilos. An international consortium led by the Piraeus University of Applied Sciences and comprised of 15 institutes, enterprises and WWF Greece is working on a renewable energy and prototype battery system, which will support both stand-alone and grid-connected operation, while proving its interoperability with the rest of micro grid components, such as demand side management aspects and distributed, residential heat storage in the form of domestic hot water. In addition, different operation strategies will be tested in order to define the optimum system integration. Also engaging with the islands of Pellworm, La Graciosa and Corsica, aiming to create an island platform that will enable transfer of technological experience by making use of the smart grid system of Pellworm, and by offering new case studies for the development of similar projects. Sustainable fisheries: As 93% of the assessed Mediterranean fish stocks are not fished sustainably while at the same time the livelihoods of the fishing communities are faced with a highly uncertain future, creating new economic prospects in tandem with the maintenance of healthy fish stocks is a win-win option. In 2013, WWF Greece and the super market chain AB Vassilopoulos (Delhaize group), together with the fishermen of the retail fisheries company “Manios” and the Fisheries Research Institute, launched the Fisheries Improvement Project for purse seiners of the northern coastal town of Kavala. This is the first such program in Greece and in the Mediterranean that aims at achieving sustainability for the purse seiners of Kavala that fish sardine and anchovy, protecting the marine environment and at the same time providing consumers with traceable and sustainable seafood. Hopefully, this will be the first certified fishing fleet (by the MSC standard) in the entire Mediterranean. Every crisis is a call for change, an opportunity for learning from past mistakes and a new way forward. In the case of Greece, the country’s wealth is an asset for a truly sustainable future.